More from Animation World Network: “UK and LA-based family and entertainment production company, Komixx Media Group, announced it has secured the worldwide rights to stylish children’s author and illustrator William Bee’s colorful series Stanley. Komixx will create an animation series that will follow the adventures of Stanley the hard-working hamster and his furry friends. 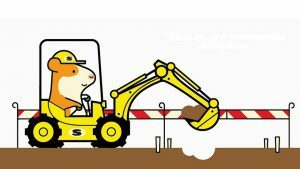 The lovable series [Stanley the Builder, Stanley the Farmer, and so forth — Ye Ed-Otter] comes from the British-born author and illustrator Ian Bilbey, who writes under the name William Bee. Komixx Entertainment has brought Bilbey on-board as its art director to develop Stanley into a much-loved animation character for preschoolers.” According to Andrew Cole-Bulgin, joint CEO and Head of Film & TV for Komixx Media Group, “Stanley is an independent, paws-on hamster who’s used to running the show… It’s going to be a lot of fun for Stanley, Hattie, Myrtle, Little Woo, and all their furry friends.” The show goes into production in 2017, then of course it will be looking for world-wide markets.